19 LISTS Fools Failing at LifeThe struggle. It's real. List Rules Vote up the most cringeworthy (but funny!) on-stage falls. Oh, how the mighty have fallen. Literally fallen. Like on the stage, off the stage, into the audience; these musicians and performers give new meaning to falling from the top. Whether it was the result of a complicated dance move, props on the stage, or loss of dexterity, there are myriad musicians and celebrities who have tumbled on and off the stage while performing. Which singers have fallen on stage? Here's a list of the world's biggest rock stars falling. These stage incidences include Madonna, Bono, Taylor Swift, Joaquin Phoenix, Britney Spears, and even the most recent celebrity fall from Aerosmith frontman Steven Tyler. At the 2015 Brit Awards, Madonna fell while performing her song, "Living for Love." Her cape, which was supposed to detach during her routine, became stuck, pulling her down the stairs to the stage below. Although she dropped her microphone in the fall, she eventually recovered and finished her performance with no further mishaps. In October of 2008, Katy Perry was performing her hit song "I Kissed A Girl" at MTV’s Latin America Awards in Guadalajara, Mexico. After jumping on top of a giant cake, the singer was covered in frosting, causing her to slip and fall as she tried to playfully smear the pink slime on the jacket of her guitar player. When she tried to stand up, the frosting-coated stage led to several more falls as the guitarist tried to help her to her feet. During a 2015 show in Toronto, singer Harry Styles lost his footing and fell to the ground when he tried to leap up onto a stage platform. He apparently suffered no injuries as he arose moments later, laughing at his own tumble. 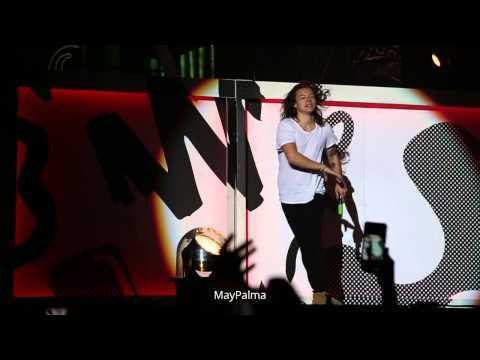 Only a month earlier, Styles also took a spill at a One Direction concert in San Diego after his mic stand apparently got caught on something. 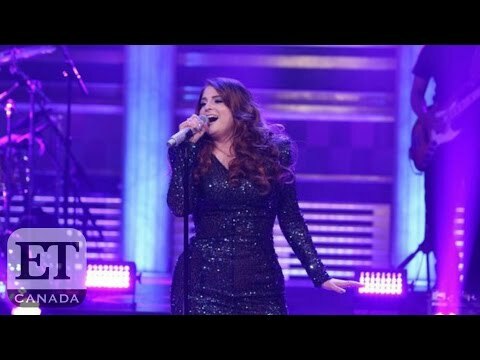 During a performance of her song "Me Too" on The Tonight Show with Jimmy Fallon, Meghan Trainor took a nasty fall, leaving her flat on her back, convulsing with laughter. Fortunately, show host Jimmy Fallon followed suit and joined her in her horizontal posture on the stage.